As reported in Cretapost, the unnamed farmer was trying to park his vehicle under the shade of an olive tree when the ground beneath him began to sink. 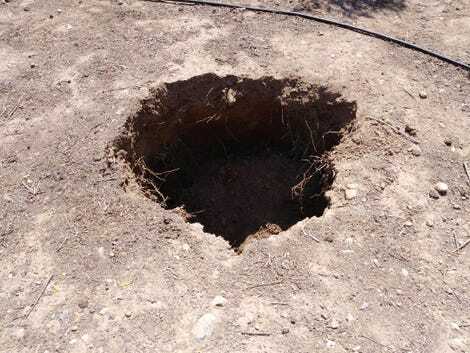 After pulling away, the farmer noticed that a hole, measuring about four feet wide (1.2 meters), had suddenly appeared. As he gazed into the void from above, he quickly realised he had stumbled upon something important. The farmer contacted the Lassithi Ephorate of Antiquities — the local heritage ministry — which sent archaeologists to investigate. 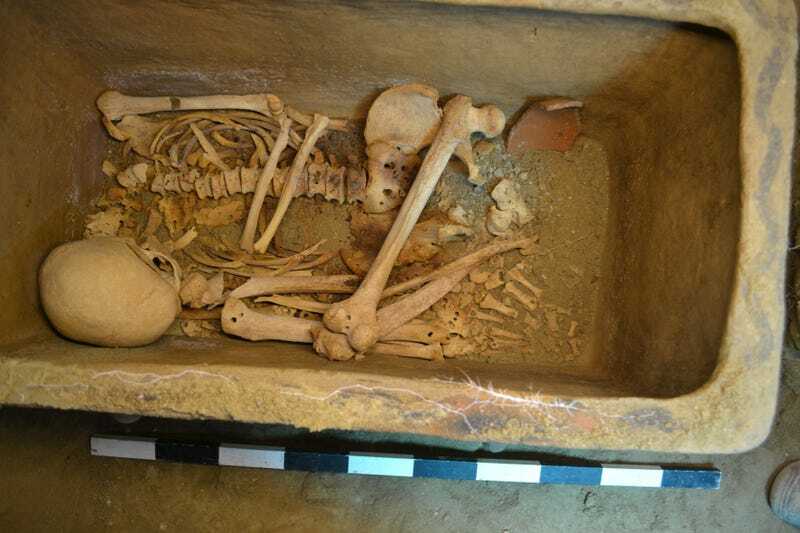 The farmer, as it turns out, had stumbled upon a Late Minoan era tomb containing a pair of coffins, each containing a single skeleton. Two dozen pots with coloured ornaments were also found inside the tomb, according to the ministry. The hole in the olive grove had opened up on account of a broken irrigation tube, which made the soil soft. 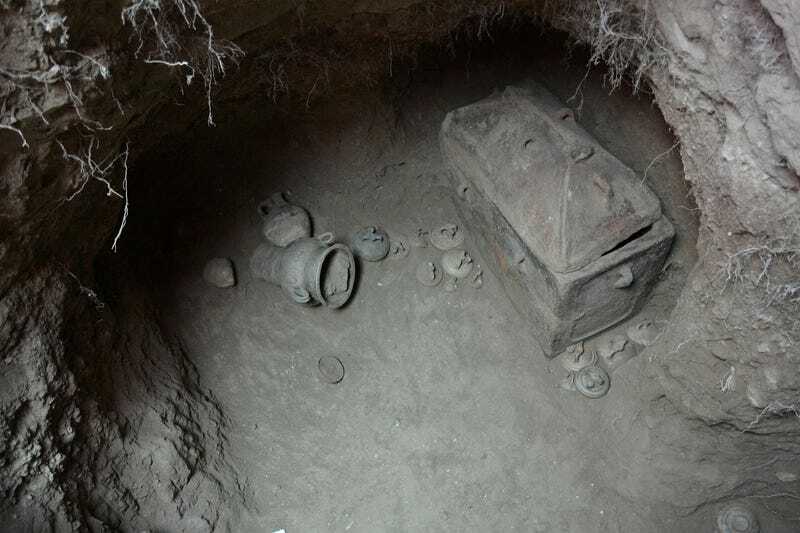 “According to the ceramic typology, and according to the first estimates, the tomb can be dated to the Late Minoan IIIA-B period, approximately from 1400 to 1200 BC,” explained the ministry in a statement. The tomb is located near the village of Kentri in southeast Crete. Importantly, the tomb, at a depth of eight feet (2.5 metres), has never been disturbed by looters. Archaeologists are now in the process of collecting as much information about the chamber and its contents as possible. Some 3,400 years ago, the tomb was dug into the region’s soft limestone, with access made possible by a vertical trench. The tomb is comprised of three carved niches, and the entrance was eventually sealed by stone masonry, according to the ministry. The two clay burial coffins, called larnakes, were in excellent condition, and embossed with ornamentations. The coffins each held a single male skeleton, the identities of which aren’t known, but the quality of the pottery suggest they were high-status individuals. Larnakes are small, closed coffins that were often used in Minoan culture. Bodies had to be placed in tight crouching positions to make them fit inside. Larnakes debuted in Minoan times during the Aegean Bronze Age. They were initially made from ceramic materials and made to look like wooden chests. These coffins were often decorated with abstract patterns, or scenes depicting hunting and religious rituals.